All of us could really take some good inspiration from this group, whether we are musicians or not. In short, if you are a fan of Fleetwood Mac, see this band while you can. It will be worth every penny. Watching Fleetwood Mac play, the first thing that is abundantly clear is that they really believe in their work and stand behind what they have produced, and with good reason. Their songs are timeless in a way that a new listener would have no idea if they were written in 1974 or next year, in 2014. The lyrics are so transcendent that any human who has ever been in any kind of interpersonal relationship (dare I say, all of us) can relate on some level. I especially loved watching kids who had come with their parents bang out every lyric to every song, even moreso than their elder chaperones. 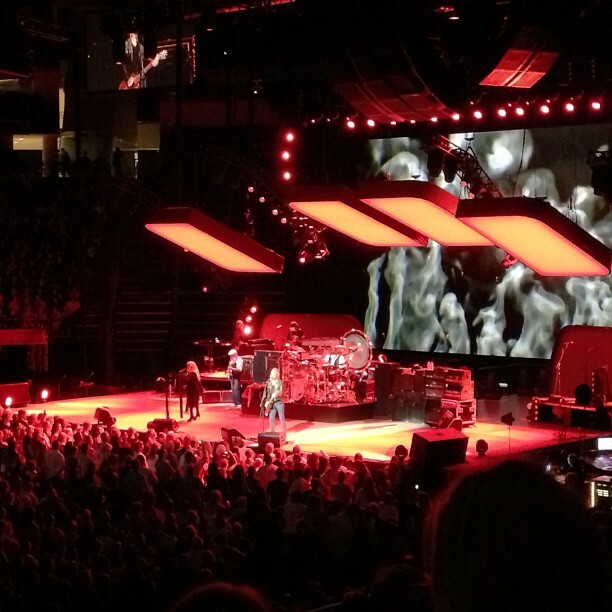 The band opened their set with "Second Hand News," and joy filled the arena. They played a grouping of other classics ("The Chain," "Dreams," "Rhiannon") before hitting several songs from their esoteric album Tusk¸ when Lindsey Buckingham -- who shall now forever be known in my mind as one of the most underrated rock guitarists of the 21st century, but more on that later -- talked about how Tusk's artistry has only been further appreciated through the years. These bandmates don't need to tour. They don't need the money or the fame. They want to tour and share their music, because they believe in it, and they admire one another. This brings us to the band itself.